Always nice to have a clean kitchen. With floors scrubbed and benches cleared away, it's worth taking a photo or two. Although, it didn't look like this for very long. Because yesterday we worked on a photo shoot in the kitchen, and as you can see, it gets rather untidy during the process. But working from home is always great, (I will show you the results when they're published in a few months) there is so much to learn, with the added bonus of a fridge filled with delicious things to eat. Today the kitchen is back to normal, a bit messy and cluttered, but at least I can spend some time in the garden, instead of cooking dinner. With a break for afternoon tea of course. I always love a glimpse into your warm kitchen! Such a beautiful kitchen! I have the same aardvark manifesto hanging in my kitchen! You have my dream kitchen. This new photo shoot sounds exciting. I remember a little while back when I realized my favorite kitchen was yours...favorite blog and favorite kitchen. Boy was I happy. :) I've been wanting to move a bookcase into mine ever since I saw yours full of dishes and cookbooks. 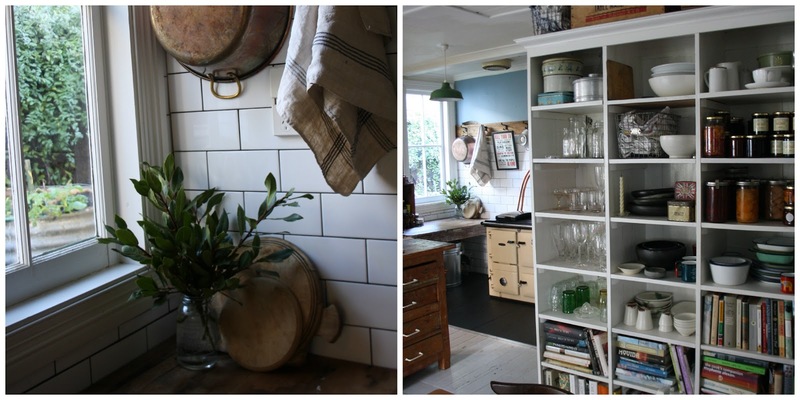 It really is the perfect country kitchen. Doing photo shoots in my kitchen would be a dream job.....I look forward to reading and seeing more about it. That's so lovely to hear Sarah, I'm so very touched. Doing photo shoots in my kitchen was always a dream job so it makes me so happy that it's become a reality. Between you and me, my real dream is to shoot my own book in there..who knows?! Moving the bookcase into the kitchen was such a great idea - so practical to have everything within easy reach! Is it possible to be joyfully envious? I think so. Beautifully clean kitchen (which is always worth taking a photo and posting about it). I wonder if I could make the word over happy by posting the ridiculous mound of laundry I must fold -they would be oh so happy not to be me! Wow, your kitchen looks wonderful. I love the book bookcase with your cookbooks/glases/etc on it.